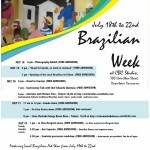 » Home » Past Events » Brazilian Week! This is a fundraiser night for VICS (Vila Isabel Charitable Society). Come see beautiful photographs or purchase family portraits to help undernourished children in Brazil. Sold portraits will be sent to needy families and funds will be used for charity projects. A lecture for those who want to learn more about this big country who shares similarities with Canada. Brazilian Ambassador / Consul General of Brazil in Vancouver Sérgio Florêncio will give an overview of the history of Brazil, its geography, economy and people. Sandra Sallovitz from DESTINOS, together with Diego Gastmann, former EMBRATUR representative, will talk about travelling in Brazil and Latin America tourism. Have a seat and discover places you didn’t know. This 5 piece band will play instrumental delicate traditional Brazilian music such as choro, early samba and bossa nova. With members from all over the world, 1 from Brasil, 2 from Japan, 1 from US, 1 from Canada, they call themselves Mistura Fina. Zumba Teacher Angela Alvarez, will bring Brazilian Music in this popular aerobic demo, all welcome to join the calorie burning class while having fun dancing. Sensei Rodrigo Carvalho will give a demonstration on this Classic Martial Arts fight with his young students. All kids welcome! Internationally celebrated Celso Machado will play his guitar and steal the scene with his vocal abilities. A night to listen to sophisticated bossa nova tunes. Sensei Celso Narita and Sensei Adam Santos will showcase the Ju Jitsu martial arts Morganti Style. All publics welcome to get closer to the Tanami and learn more about this different style. Brazilian Dances and capoeira demo. Come join a percussion demonstration if you would like to know more about the rhythms that make other people shake. Instruments are provided. Fun for all ages.